I spent the day in bed today, although the pressure mark seems to be minor and I hope to be up and about tomorrow. Actually, I must have needed the rest. I slept most of the day until about 330. A lazy day that should leave you Monday workers jealous!. If you would like to experience horror, type “spinal injury and pressure sores” into Google images and look at some of the ulcerations that are possible. Don’t worry mine is nothing like that – it’s a tiny red mark, insignificant provided I take it seriously. I was allowed up for one hour and I spent that time, firstly getting a coffee and, secondly, in physio – as you can see I have my priorities correct. I had the pleasure of spending my time in the gym chatting to Sheree and her beautiful dog Jade. Sheree had her accident 13 years ago and is a C5 quadriplegic with functionality similar to mine – I have things a little better given that I have some use of the right-hand that she does not. Sheree lives on her own, works full time, and has written a number of books related to spinal-cord injury. She is able to do this with the help of the amazing Jade. This dog helps to open doors, pick up things she is drops, opens the fridge and gets out food, hangs out the washing – and so on and so on. 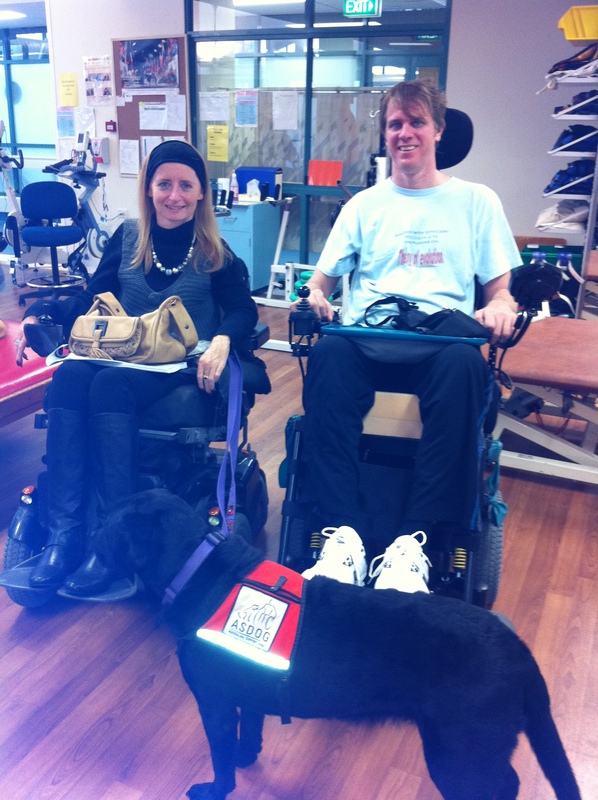 A society without barriers for people with spinal cord injury. Our constant innovation creates independence and unlimited opportunity for people living with spinal cord injury. but whatever the formalities of her institution, from the perspective of my little world, her visits every Monday are a true blessing. I love the hospital staff – the nurses and physios and doctors and occupational therapists (and I’d better write about them all one-day), but there is nothing like talking to someone who has experienced what you are going through and who has made so much of her life. We are able to talk about all the joys and challenges of being in a chair and she provides endless practical advice. But more than this sharia is a delightful person and I love spending time with her. when she leaves Monday afternoons I am always a happier and more hopeful soul. Glad you have your priorities right Shane, coffee truly does come first, I need to work out a morning prayer into my caffine fix, maybe my addiction could help my spiritual life! You are such an inspiration Shane. Your positive outlook really puts any of my complaining (even though it seems like a big deal at the time) to shame. I hear you are very close to coming home to your lovely family, in your new house. I can’t wait until you release your book…. Keep up the good work with physio etc Our love and best wishes Carol, Jordy & Chloe. At the risk of repeating what others have said… You are truly inspiring. I have been reading your AWP blogs faithfully. Thank you so much for your candor. My nephew, Justin, has a service dog like Jade. He has MD and had been using a wheel chair for more than a decade. He is amazing too, he has just completed his IT degree, graduating this last December. Justin’s dog Fancy was trained by a group in the States called Paws with a Cause. Fancy can turn on/off light switches and opens doors. She also will not relieve herself until she is given the command “Take a break, Fancy,” quite amazing.